Every baseball fan knows about the Red Sox Curse, but did you know there was more to the curse than simply punishment for trading Babe Ruth? And did you know that the Curse doesn’t just hurt rabid Red Sox fans but also the daily lives of the ‘Cursed Creatures’ who lived underneath Fenway Park? Will the curse ever be broken or are the underground inhabitants of the baseball park doomed to live forever in a dark and bleak world? This is the premise of Julianna Baggott’s very original pre-teen novel The Prince of Fenway Park. Oscar is just a regular boy living near Boston, MA, albeit a bit downtrodden. He gets picked on at school, his mother is temporarily leaving to move in with a boyfriend in another state and his dad just doesn’t seem interested in him. Add to that the fact that Oscar is adopted, his parents are divorced and they are Caucasian while he’s African American, and he’s convinced that nobody loves him. When Oscar’s mom leaves her son with her ex-husband, Oscar is even more miserable. The young boy has never been close to his father who was always a bit mysterious about himself. Oscar is convinced that his father is a gangster. Imagine his surprise when he learns that his father is actually a fairy and living underneath Fenway Park. Once Oscar moves in with his father, The Prince of Fenway Park takes off on a fun trip through the mysterious lives of the Cursed Creatures. There’s Weasel-man with his pack of weasels, the Pooka and Banshee, the roving mice, as well as a slew of other minor characters roaming the tunnels beneath Fenway. Oscar soon realizes that he is the one who has the power, talent, and knowledge to end the Curse. With grit and determination, the young boy sets off to discover the secrets that will end the Curse and release the Cursed Creatures as well as allow the Red Sox to finally win a World Series. 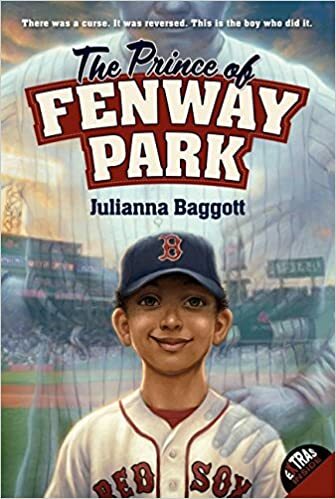 Part mystery, part thriller, with a little spy novel thrown in for good measure, there is much to recommend The Prince of Fenway Park to young readers. It will appeal to baseball fans while Red Sox fans in particular will enjoy all the references to past games and players. However, readers who also enjoy a good mystery will find much to recommend this book. The author takes on more than just a fictional (or is it real?) curse in her newest book. She carefully takes on the theme of racism as young Oscar travels to the past through the ‘Door to the Past’ and meets many famous ballplayers from long-ago, including several African Americans. Oscar experiences firsthand the racist remarks that these great players had to endure to participate in the game they loved. Like them, Oscar too has had to endure derogatory remarks from classmates about his race, his parents, and how he doesn’t fit in. Oscar learns from Babe Ruth how best to deal with such hatred and then re-educates Ruth when he says, “…I’m going to learn from you that it isn’t something wrong with you. It’s something wrong with them.” Baggott skillfully merges the ugliness of racism with the lonlieness of not belonging without being preachy. Many young readers will relate to her themes as they turn the pages. Quill says: Young baseball fans will love solving the mystery of the Red Sox Curse.